It's only a month ago since FOE released their debut-CD, and it's already time for their next release, a three-way split-CD with American Heritage and Art Of Burning Water. American Heritage are the only American band on this CD, the other two being from London, but their sound fits well with the overall atmosphere of this album. Formerly an instrumental band, this Chicago four-piece already released a few albums with some success. No surprise, as their very mathy noise rock comes with great melodic guitar lines they probably inherited from their metal past (don't we all have a metal past?). What would sound cliché-laden with other bands gives the music a quite distinctive trait that makes the three rather long songs featured songs here a sheer pleasure to listen to. The instrumental FOE are sandwiched between two vocal bands but show - as they did already on their still fresh debut - that good music works also without vocals. Although they only offer with Myrmidon one track, it's full ten minutes long and can be appreciated as a compendium to their music in general, except that this song seems even more playful than their already more than promising debut. Knowing that next year they are about to release an album with a thirty minutes song makes my ears already water. The last four songs are from Art Of Burning Water, a band with strong Middle Eastern influences. Their music comes very raw and reminds of the Melvins' sludginess combined with the vast soundscapes of Neurosis, all mixed to a heavier conglomerate. Nothing for the faint-hearted indeed, but a still young band that already masters the secrets of heavy guitar music. 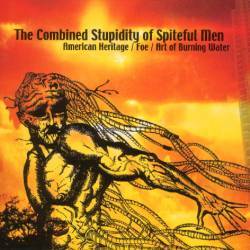 All of this makes The Combined Stupidity Of Spiteful Men a really pleasing ride, starting with the melodic abrasiveness of American Heritage, then dipping you into FOE's playfulness, before getting back to reality with AoBW's harsh visions. 9 points!